It's zucchini season!! Because this stuff always grows in abundance, there can never be enough zucchini recipes. Here is my contribution. I enjoy making light vegetarian tarts for weekend lunches. Whatever vegetables are in season, will find their way into my tarts. 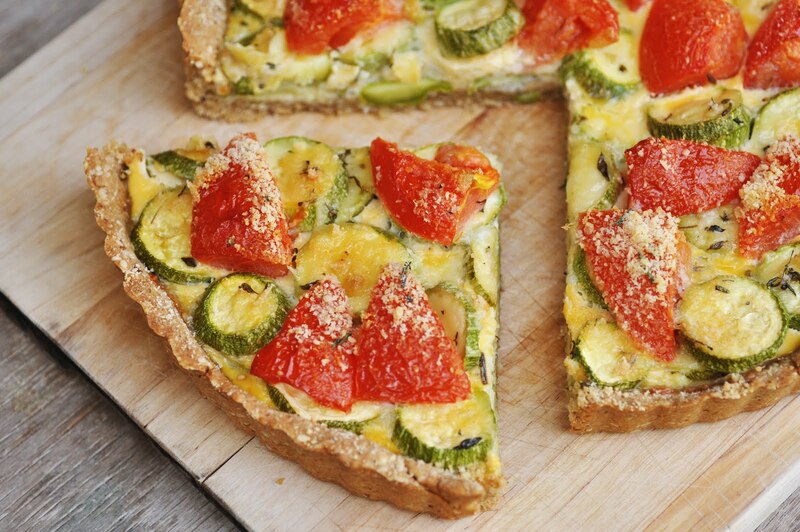 The tricky part with vegetarian tarts is their seasoning. Many vegetables are quite bland, and I don't just want to put tons of salt in it to get some flavor. 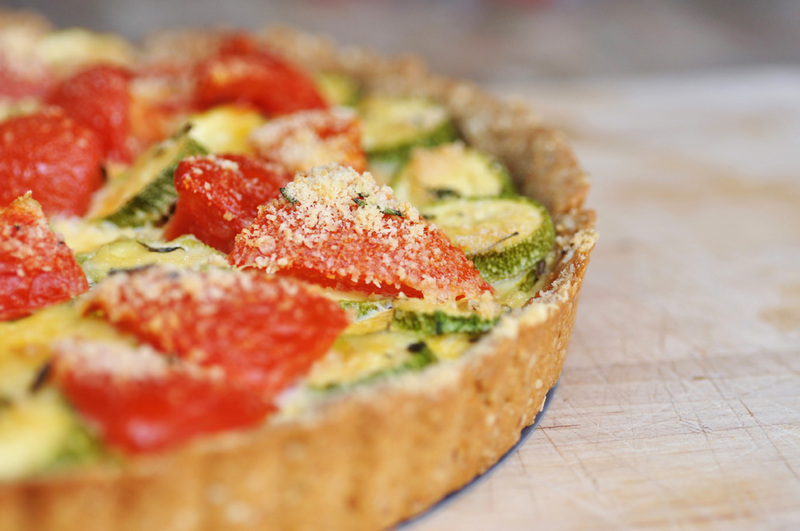 This tomato zucchini tart gets its flavor from layers of Parmesan cheese and fresh herbs between the zucchinis and tomatoes. The cheese melts nicely into the veggies as there is just enough egg to hold everything together, but not drown the veggies. The crust is my favorite crust from my spinach tart. The toasted sesame seeds in there give it a lovely twist. This tart just screams SUMMER at me. The vibrant colors of it make me want to have lunch outside in the garden. Spread the oats and sesame seeds on a baking sheet and toast in the oven for 8 minutes. Transfer the toasted oats and sesame seeds to the bowl of a food processor fitted with a metal blade. Add the flour, baking powder, salt, and pepper, and process until the oats are finely ground. In a medium bowl, whisk together the water and oil. Mix in the dry ingredients to form a dough. Roll out the dough on a lightly floured surface. Put the dough in the tart pan. Press it down evenly, making sure to fill in the fluted sides of the pan. Trim the tart of any excess dough. Cover with foil or damp towel and keep refrigerated for 30 minutes. Cut the cherry tomatoes in halves and toss in olive oil. Combine the Parmesan, herbs and garlic. Take on third of the cheese and herb mixture and sprinkle it over the bottom of the tart pan. Arrange the zucchini slices in one layer over the cheese to cover it. Season to taste with salt and pepper. Sprinkle another layer of the cheese herb mixture on top followed by one more layer of zucchini slices. Arrange the tomatoes on top of the second zucchini layer. Combine the egg and milk. Pour egg mixture evenly over the top and let it sink into the tart. Top with last third of the cheese and herbs. Bake the tart for 35-40 minutes. Let set for 10 minutes before serving.